Hawke River Outfitters handpicks guides for their experience on the river, as well as their experience in working with guests. 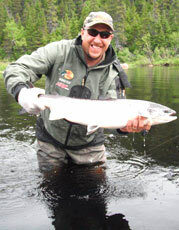 We want to provide you, our guest, with the best fly fishing experience possible. Hailing from Brig Bay, Newfoundland, Wally is a commercial fisherman where he fishes for lobster, cod and even eels. Wally has guided fisherman in Labrador and Newfoundland for most of his life. 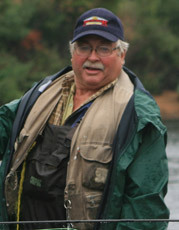 His general knowledge of the river and the outdoors, combined with what can only be described as a huge sense humor, make him a pleasure to have around. Also, when given the chance, he’s capable to show even the most seasoned angler a thing or two. Sam comes to us from the community of Plum Point on the Northern Peninsula of Newfoundland where, like Wally, he is a commercial fisherman. Sam shares a great love for the outdoors and the river, and is willing to go the extra mile to see his guests receive the best possible fishing experience. One more thing you need to know about Sam is that when put together with Wally, the two are a comedy show for sure. Wade comes to us from Bird Cove on the Northern Peninsula of Newfoundland. 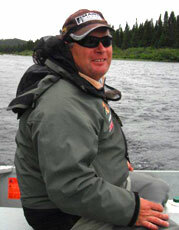 When not guiding with us at Hawke River, Wade will be guiding for moose on the Island. Quiet and knowledgeable , from the first day of the season until the last, Wade brings his "A" game to the river. 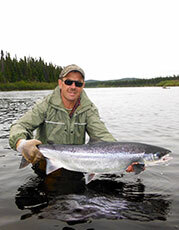 For years Aster has waded the banks of the Hawke River, and many of the rivers of the Northern Peninsula of Newfoundland where he has honed his skills as an angler, guide, and outdoorsman. Aster's knowledge and attitude are second to none, which make him pivotal to our operation. In addition to being a great guide and angler, Aster possess a rare gene where he would actually prefer to see you catch a salmon than himself.